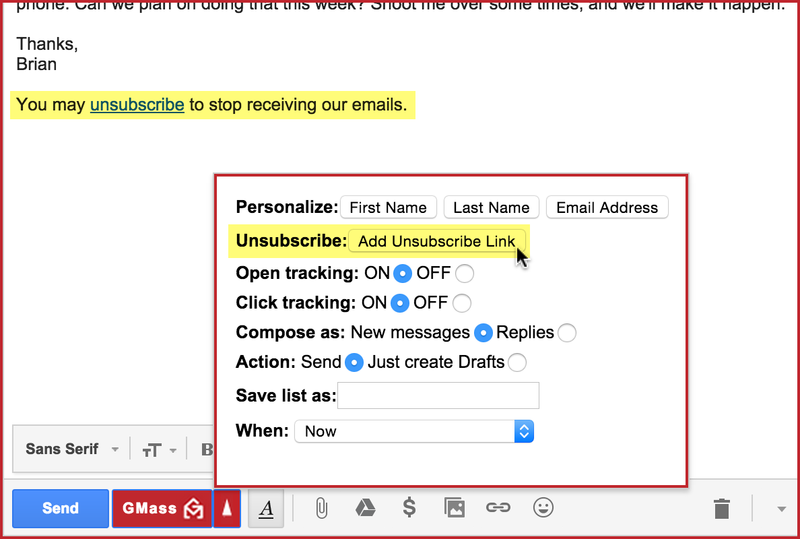 You now have the option to insert an Unsubscribe link into your email marketing campaigns with GMass. To insert an unsubscribe link, just click the Add Unsubscribe Link link in the Settings box, and a link will be added at the cursor in the body of the message. We recommend that an unsubscribe link be added to all mass emails containing promotional or marketing content, but the decision is up to you. If you don’t have regular back-and-forth email correspondence with the people whom you’re emailing, it’s wise to include an unsubscribe link. If a recipient clicks the link, their email address will be placed on your GMass account’s Unsubscribe List. 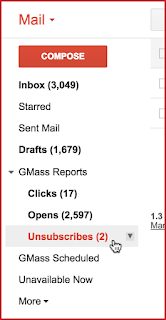 You’ll also be notified via a report that will appear in the GMass Reports –> Unsubscribes Label in your Gmail account. 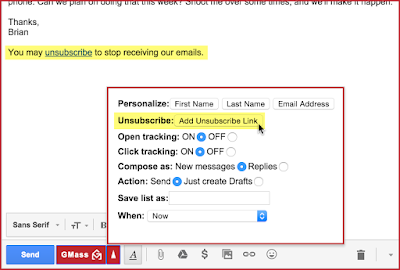 When you send future mass emails with GMass, your email list will be checked against your Unsubscribe List, and anyone found on the unsubscribe list will be removed automatically as a recipient. You don’t have to manually remove people that have unsubscribed from your source email list because GMass handles the elimination of unsubscribed addresses from campaigns for you. This is what your recipient sees after clicking the Unsubscribe Link. For free accounts, a text link to GMass is also included on this page. For paid accounts, as shown in the screenshot above, there is no link to GMass. To re-subscribe an address, the subscriber must click on the re-subscribe option after unsubscribing. One can re-subscribe anytime by clicking on any unsubscribe link from any past GMass email. Note that deleting an unsubscribe report from the GMass Reports section will not remove an address from your unsubscribe list. If you wish to manually unsubscribe certain email addresses, you can easily add them to your account. Just follow the instructions here to import an unsubscribe list. If you wish to manually re-subscribe certain email addresses, you can do so by following these instructions to manually remove an address from your Unsubscribe list. If you wish to manually insert the unsubscribe link into the body of your emails, so that it flows with your email design, create a link to:https://www.gmass.co/gmass/u?u=OUTBOUNDThe “OUTBOUND” part will be replaced with a unique identifier at the time the email is sent, and the “www.gmass.co” part will be replaced with your account’s tracking domain. This isn't working. I unsubscribed myself and followed the steps to re-subscribe. My email does not show up in the draft for me to unsubscribe and then re-subscribe. 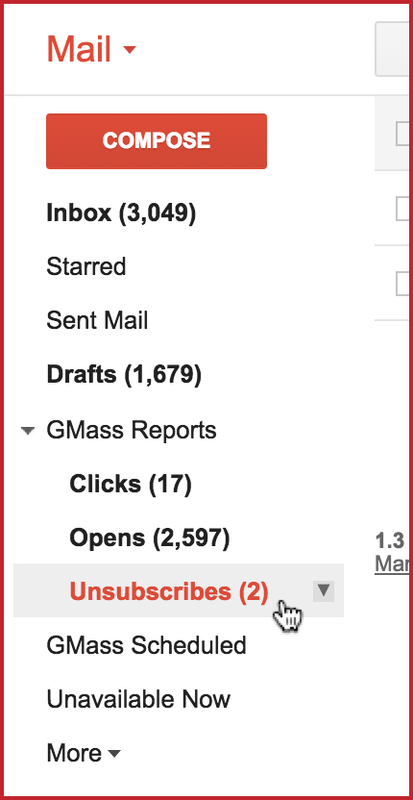 A GMass unsubscribe does NOT affect sending with the regular Gmail "Send" button. You will still be able to send with Gmail's Send, even if an address is on your GMass unsubscribe list. You are right — the instructions in the post weren't accurate. I've edited the post now. If you don't have access to the unsubscribe link to re-subscribe, email me at support@gmass.zendesk.com and I can help you. I'd love if there was a way to totally personalize the unsubscribe form. I'm doing wedding photography marketing with gmass and the more they think it's all written just for them the better! Ideally it would hit them with one more question on the way out that I could customize. Have you guys thought about making this a wordpress plugin? I have downloaded GMass and enable it, but the extension button is invisible and I cannot use it. what can I do to fix this? instead of using your "draft" process to unsubscribe, can I manually move to "unsubscribe" folder? If a receiver unsubscribes, does that unsubscribe him from ALL emails I send, even if the subsequent email is from a different googledocs sheet? In other words, if a person unsubscribes from one marketing campaign, does that unsubscribe him from ALL marketing campaigns that I run, even if I use a different mailing list? Yes, if your recipient clicks the Unsubscribe link, it unsubscribes that email address from all subsequent GMass campaigns sent via that particular Gmail account. So yes, even if you maintain separate mailings lists, as long as you're sending from the same Gmail/Google Apps account, an unsubscribe is universal to your whole account. Unfortunately, no. Manually applying the "Unsubscribes" Label will have no effect on what addresses are actually unsubscribed. I hear you on that feature request and will add it to my list of features to consider building in the future. How to modify the unsubscribe link pointing to our own domain with the new cname record? Then is it possible to remove the name “GMass” in the same unsubscribe page? If I use the unsubscribe link in the body of the email will it also be added to the follow-up email, or do I need to manually add them? Is it possible to customize the unsubscribe link and the message ? Yes, absolutely. Follow the steps under #4 “If you wish to manually insert the unsubscribe link” above. https://www.gmass.co/gmass/u?u=OUTBOUNDThe “OUTBOUND” part will be replaced with a unique identifier at the time the email is sent, and the “www.gmass.co” part will be replaced with your account’s tracking domain. Could you give more detail how to do that? The replacing would be done automatically? Should I do it manually? I have already using a custom made tracker with a CNAME setup as you advise. Would love to be able to allow readers to Unsubscribe from one list, but remain a subscriber on other lists they have requested.